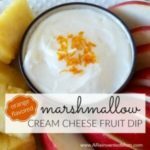 Orange Flavored Marshmallow Cream Cheese Fruit Dip puts a citrus twist on a beloved fruit dip. Combine the cream cheese, marshmallow creme, orange juice and orange zest in a medium-sized bowl. Garnish with reserved orange zest. Serve with strawberries and pineapple spears, or your favorite fruit. Helpful tip: to get the most juice from your orange, roll it on the counter top until it softens.